MIAMI — A tropical storm watch was issued for the Virgin Islands and Puerto Rico as of 8 p.m. Sunday. A tropical storm watch means that the Virgin Islands and Puerto Rico face a threat from Tropical Storm Danny within 48 hours. The first hurricane of 2015 in the Atlantic was moving west at 9 mph as 5 a.m. EST today. The small storm was located about 60 miles east-northeast of Dominica and 70 miles east-southeast of Guadeloupe ,as of the 5 a.m. EST advisory from the hurricane center this morning. The National Hurricane Center said Danny’s maximum sustained winds remain 40 mph as of 5 a.m. EST. today — the same wind speed it was at 8 p.m. last night. Tropical storm force winds extend out 60 miles in all directions from the center of its circulation as of 8 p.m. EST. Reserve Hurricane Hunter aircraft is 1007 mb (29.77 inches). Danny is expected to continue to weaken. Dry air and wind shear (or the veering of winds with height) has caused the center of circulation to become exposed, the hurricane center said. The official forecast has Danny weakening to a tropical depression within a couple of days. A weakened Danny should bring welcome rainfall to the drought-stricken Virgin Islands and Puerto Rico. The Virgin Islands as well as the eastern half of Puerto Rico are classified as in either severe or extreme drought, according to the U.S. Drought Monitor analysis. St. Croix (-11.59 inches) and San Juan, Puerto Rico, (-10.70 inches) have significant year-to-date rain deficits through Thursday, a large chunk of those since June 1. Dating back to 1951, it has been the driest year-to-date on record at Henry E. Rohlsen Airport on St. Croix, picking up only 7.31 inches of rain through August 20. The weather associated with Danny is expected to dump between 2 to 4 inches of rain on the Virgin Islands between Monday and Tuesday. Danny was moving west at 9 mph and was expected to continue on that general path through Monday while continuing to weaken. A Category 3 hurricane at its peak, Danny was downgraded to a tropical storm over the weekend. 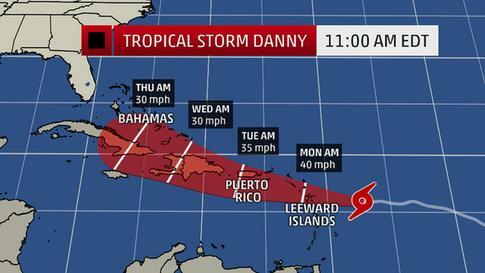 Danny was expected to pass through the Lesser Antilles late Sunday or Monday and be close to Puerto Rico by tomorrow. Forecasters warned those in the Leeward and Virgin Islands to watch Danny carefully. A tropical storm watch was in effect Saturday for the islands of Antigua, Barbuda, Montserrat, St. Kitts, Nevis, Anguilla, Saba and St. Eustatius, St. Maarten, Guadeloupe, St. Barthelemy and St. Martin. The hurricane center said tropical storm force winds will be possible in the watch area starting late Sunday. Two to four inches of rain is also possible in the Leeward Islands from Danny.